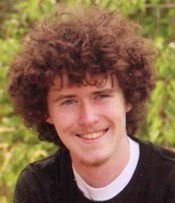 Joshua James Ehlers, 24, of Berthoud, died suddenly September 23, 2011 in Aurora. He was born March 4, 1987 in Bismarck, North Dakota to James H. and Juanita J. (Kurle) Ehlers. Joshua has lived in the Berthoud area with his family for many years. He graduated from Berthoud High School in 2005 as the class President and President of the Student Counsel. Joshua was a member of the ROTC and had a Congressional Nomination for the US Navel Academy. He ran cross country while in school at Berthoud. Joshua attended CSU and Front Range Community College. He loved his music, learning to play a left hand guitar. He loved flying model airplanes and dirt bike riding. Joshua was a Boy Scout, achieving many levels. He worked for Thompson R2J school district for many years and for the Amgen Company. Joshua is survived by his parents James and Juanita Ehlers of Berthoud; sister Amanda Lynn Ehlers of Ft. Collins; half brother Clint Ehlers and half sister Kristie Ehlers-Brown both of Houston, TX; Aunts/Uncles Maryann Barnson of Longmont, Wilma Kurle of Longmont, Twanette Kurle (Jim Johnston) Loveland, Anita Kurle of Longmont, Jim Kurle of Reagan, North Dakota, Eugene Kurle of Mercer, North Dakota, Douglas Kurle of Mandan, North Dakota and Elizabeth Yarberry (Dave) of Luttrell, Tennessee. ; and many cousins. He was preceded in death by his grandparents and an aunt. Funeral services will be held Saturday, October 1 at 2:00 p.m. at Life Spring Covenant Church, 743 So. Dotsero Drive, Loveland. Viewing will be held Friday, 4 p.m. – 8 p.m. at Viegut Funeral Home. Memorials may be made to the Joshua J. Ehlers Memorial Fund in care of Viegut Funeral Home.